The surging Milwaukee Brewers hold several key advantages over the Los Angeles Dodgers as they enter the National League Championship Series. Dodgers pitcher Walker Buehler is Monday’s Box-Toppers Player of the Day, in one of two National League tiebreaker games to determine postseason seeding. Meanwhile, Brewers pitcher Josh Hader is Box-Toppers Player of the Game in the other game. The Boston Red Sox finish the season atop Box-Toppers team rankings, leading all teams for the ninth straight week. Meanwhile, the Milwaukee Brewers maintain their lead among National League teams as they and the Houston Astros were the hottest two teams of the season’s final 10 days. The Boston Red Sox maintain their lead in Box-Toppers team rankings for the eighth straight week. Meanwhile, the Milwaukee Brewers maintain their lead among National League teams and the Los Angeles Dodgers are the hottest team of the past week. The Boston Red Sox maintain their lead in Box-Toppers team rankings for the seventh straight week. Meanwhile, the Milwaukee Brewers maintain their lead among National League teams and the Los Angeles Angels are the hottest team of the past week. The Boston Red Sox maintain their lead in Box-Toppers team rankings for the sixth straight week. Meanwhile, the Milwaukee Brewers leap eight spots up Box-Toppers team rankings to fourth place, jumping to the lead among National League teams after making Aug. 31 deadline trades. 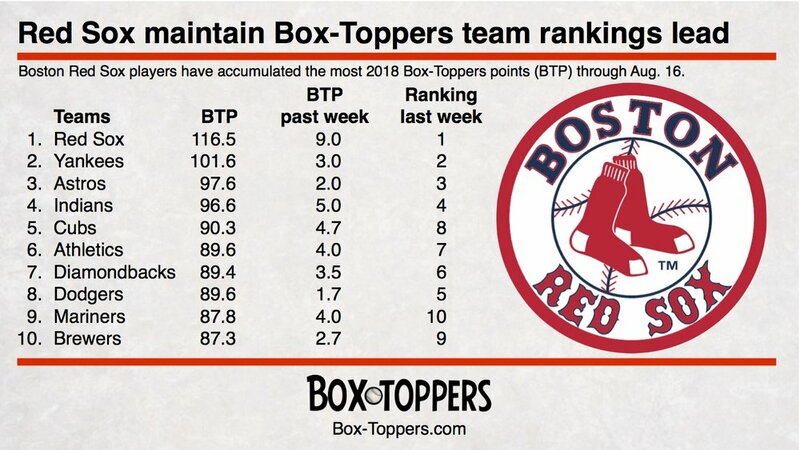 The Boston Red Sox maintain their lead in Box-Toppers team rankings for the fifth straight week. Meanwhile, the Chicago Cubs rise to regain the lead among National League teams and the New York Yankees are the hottest team of the past week. 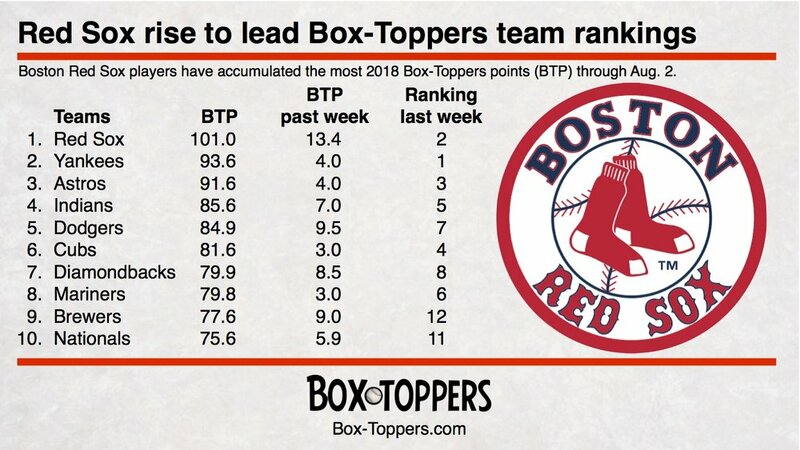 The Boston Red Sox maintain their lead in Box-Toppers team rankings for the fourth straight week. Meanwhile, the Arizona Diamondbacks squeak past the Chicago Cubs to top National League teams and the St. Louis Cardinals are the week’s hottest team. 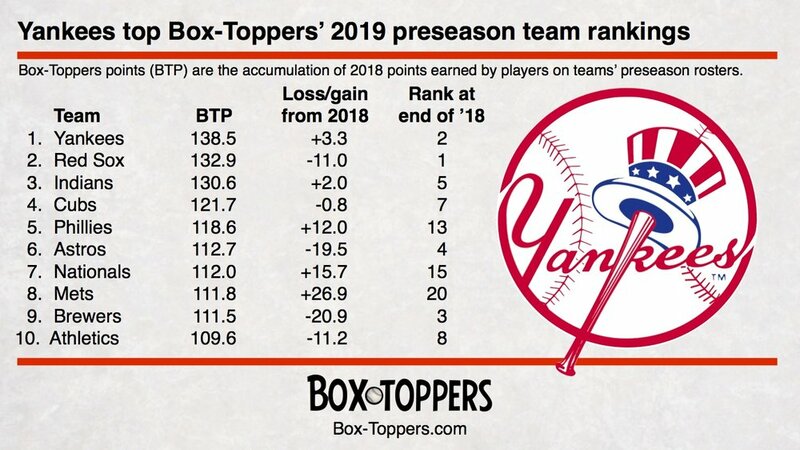 The Boston Red Sox maintain their lead in Box-Toppers team rankings for the third straight week and are also the week’s hottest team. Meanwhile, the Chicago Cubs rise past the Los Angeles Dodgers to top National League teams in rankings. 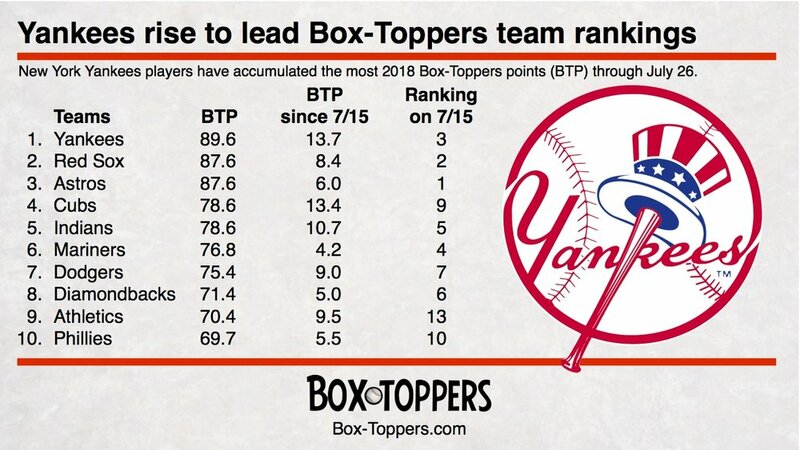 The Boston Red Sox rise to lead Box-Toppers team rankings after acquiring Ian Kinsler from the Angels and winning five of six games they played this week. Meanwhile, the Los Angeles Dodgers rise to lead National League teams after acquiring second baseman Brian Dozier from the Twins and pitcher John Axford from the Blue Jays. 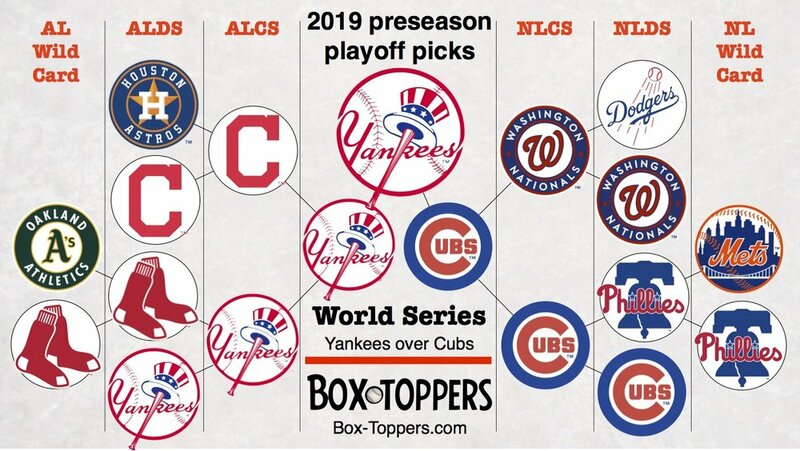 The New York Yankees rise to lead Box-Toppers team rankings after acquiring pitcher J.A. Happ from the Blue Jays. Meanwhile, the Chicago Cubs rise to lead National League teams.